The media have been pushing a line, following Republican victory in last week’s midterm election, that the one area where Barack Obama and a now GOP-controlled Senate might find room for compromise is trade, especially the approval of the Trans-Pacific Partnership, or TPP, a twelve-nation deal. The Wall Street Journal, Fox News, The Washington Post and the Daily Beast, among others, along with Obama and few Republicans, have suggested that Mitch McConnell will be more likely to bring the deal to a vote than Harry Reid, who refused to do so. But Public Citizen says talk of Republicans giving Obama fast-track approval is just wish fulfilment. It’s the House, not the Senate, that matters when it comes to trade authorization (Clinton got NAFTA early in his first term but later a Republican-controlled House denied him fast-track power, with 171 Democrats and seventy-one Republicans voting no). There are only “a handful of House Democrats who supported the bill: eight out of 201 members,” writes Public Citizen, and three of them attached conditions on their “yes” votes that are unacceptable to Republicans. As with NAFTA, the lobbying will be intense to pass the deal, with the lucre of corporate campaign contributions sweetened by the praise that would be heaped on yea-voting members for transcending partisanship. It would be a disaster were the TPP to pass and go into effect, for multiple reasons: it deregulates financial speculation; it eviscerates the ability of nations to enforce environmental regulations; it locks in a deeply unequal trade and intellectual property-rights regime, granting a handful of the world’s largest corporations monopoly protection; and it encourages the privatization of public services and public property. Worst of all, it, it globalizes the so-called Investor-State Dispute Settlement, or ISDS, which allows corporations and investors to “sue governments directly before tribunals of three private sector lawyers operating under World Bank and UN rules to demand taxpayer compensation for any domestic law that investors believe will diminish their ‘expected future profits.’” Under such provisions, mining corporations have taken El Salvador to court for trying to limit their right to open-pit mine the country and pollute its rivers and El Lilly has sued Canada, complaining that its patent laws have hindered profits it could make on an ADD drug. Public Citizen writes that “over $3 billion has been paid to foreign investors under U.S. trade and investment pacts, while over $14 billion in claims are pending under such deals, primarily targeting environmental, energy, and public health policies.” “Corporate power unbound,” is how Northeastern law professor Brook Baker puts it, specifically of what ISDS means for pharmaceutical companies. Even Forbes thinks ISDS is “overkill,” since is socializes financial risks and “reinforces the myth that trade primarily benefits large corporations.” But that’s just honesty in advertising. The Obama Administration is not backing down. Recently (on Halloween), US Trade Representative Michael Froman, referring to a similar trade deal with Europe (the Transatlantic Trade and Investment Partnership), insisted on including a strong ISDS provision: “It’s hard to imagine a high-standard agreement—this is intended to be an agreement that’s a model for the rest of the world—it’s hard to imagine a high-standard agreement that doesn’t have the high standard of investment protections as well”; “ISDS fundamentally gives our investors abroad the same rights we give foreign and direct investors in the United States: the right to not be subject to discriminatory or arbitrary treatment.” “We’re going to keep on working to get it done,” Obama just said. If a “high-standard” ISDS is included in the Trans-Pacific Partnership, the results could be catastrophic, especially for the environment and people fighting to protect the environment. In Peru and Chile, two parties to the deal, mass mobilization against intensified resource extraction has had some success. Peru’s President Ollanta Humala ran for office as a leftist, but once in power cracked down viciously. Scores of anti-mining activists have been killed by security forces but the protests have continued: investment in gold, silver and copper has dropped as a result of the unrest and industry stocks have “spent the last few years on a roller coaster ride.” A robust ISDS could give Humala and foreign corporations the upper-hand. In Chile, environmentalists have lately scored a number of important victories. After years of organizing, activists earlier this year forced the government to cancel HidroAysén, a project to build multiple dams in pristine Patagonia (though yet another dam looms). Even more recently, a Chilean court sided with a local community and blocked the development of a gold- and cooper-mine owned by Goldcorp, a Canadian corporation. Under the terms of ISDS, Goldcorp would be able to sue Chile to have the decision reversed—or be compensated for the loss of expected profit that it would have made were the mine to go forward. The thing is, no one knows if a tough ISDS is included in the trade negotiations. From the beginning, the Trans-Pacific Partnership has been shrouded in so much secrecy that it lends legitimacy to the worst fever dreams of Sovereign Citizen types. Corporations have had access to the negotiating text of the treaty, but not the public. 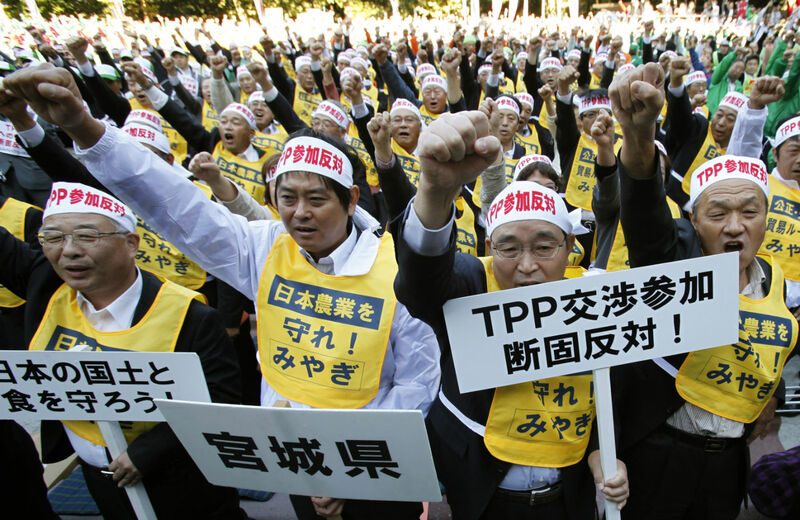 What we do know about TPP largely comes from Wikileaks and other watchdog organizations. If the United States were really honest about the Trans-Pacific Partnership, it would be debated under the War Powers Act and administered by the Pentagon, for in effect it will, just as NAFTA and CAFTA have done, institutionalize a regime of perpetual crisis, to which there is only one solution: perpetual militarization. Central America and Mexico writ large across the Pacific Rim.